Travelling has taken a new turn in recent years as more and more people are getting into the idea of camping, away from the chaos of city life. Camping is a fun-filled activity where you move out of the hustles and bustles of daily chores and spend a time of calm and serenity. One of the most primary things to get hold of while you choose to camp is the heavy duty tent cots. This is your individual dorm where you spend a relaxing time with yourself. 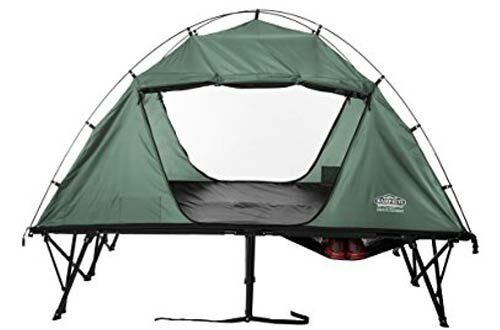 As in recent years, many people have understood the importance and fun of camping; finding the right tent cot out of the huge number of options is certainly a challenge. In this article, we have narrowed down on the tent cots that are available on the market and designed for a better experience. 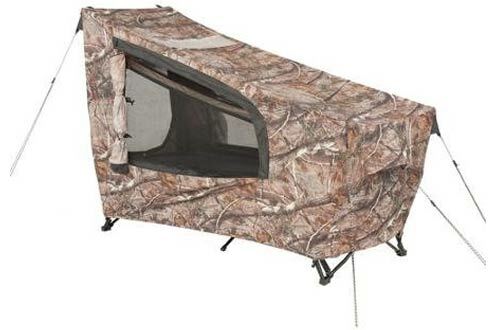 GAOAG Ozark Trail Realtree AP Instant Tent Cot - Sets up in just seconds! 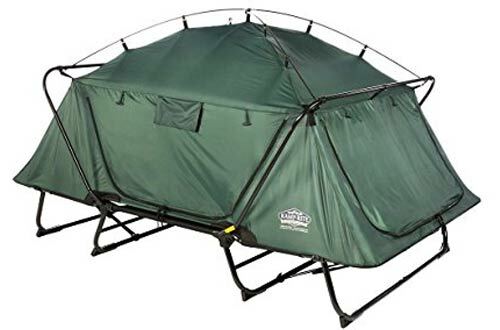 This tent is easy to set-up and install and a tent cot is crafted to give a better camping experience for all. 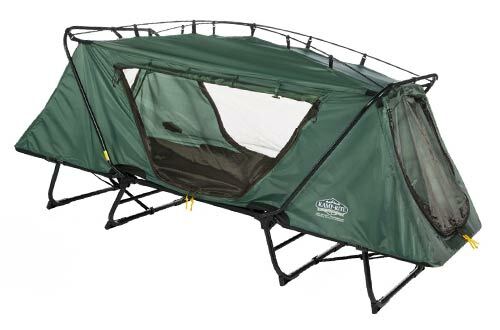 It is far more comfortable than sleeping on the ground, greatly reducing the risk of moisture, snakes, and rodents because of the elevated platform which is 11-inches above the ground. The fully framed structure, nylon sides and opaque material rest above the ground and have adequate headroom and space for a relaxing night. Moreover, this aluminium framed cot can be transformed into a lounge chair when you are in a mood for a relaxing time. It can practically be set up in no time and is made with a highly-durable aluminium frame. The cot can support a load of 300 pounds with ease and the innovative design makes it a leader in off the ground camping gears. Moreover, it comes with 3/8” foam pad for added comfort and insulation from cold extreme weather conditions besides being situated 11-inches above the ground. Cleverly designed, the cot can be folded down to 32”*30”*6” and can be transported very easily. When it comes to reliability and durability, this is a product to look out for. A complete package comprising of every single thing you need for a comforting sleep inside the tent. 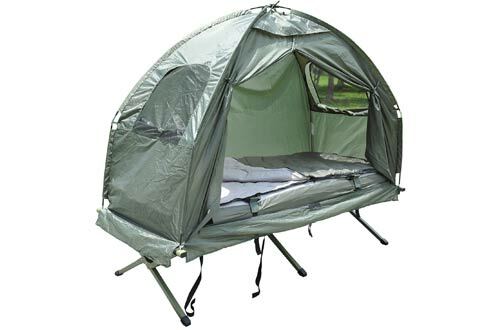 It comes with a pop-up tent, air mattress and even a sleeping bag with pillows and sheets. The easy to set-up as well as take down, the design lets you have more of the camping and fewer hassles in installing it. Besides being smart, the cot also has a large zippered door for entry and exit and the whole setup can be detached to form a separate cot and tent. Undoubtedly, a better camping experience! Another reliable product from the trustworthy name of Kamp Rite, the collapsible tent boasts a stand out design. The separate tent and cot can be used for independent usage or can be combined to form a single structure. It has a heavy-duty, weatherproof cause of 210 D Nylon construction with corrosion resistant zippers for top-notch durability and reliability. Plus, it comes with No-See-Um mesh doors ensuring better privacy. The compact design measures 6”*6”*42” when not in use making it easy to carry. 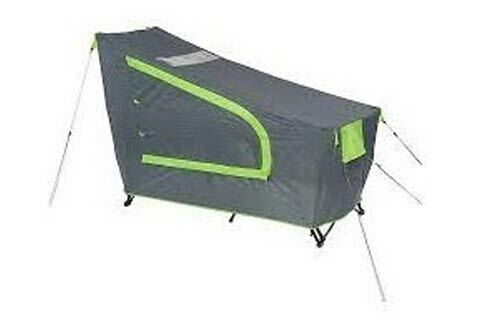 It is a two-person version of the long line of tent cots from Kamp Rite. Constructed out of 190 TPU Nylon fabric, the cot rests at 8” height from the ground and made of a lightweight aluminium frame. 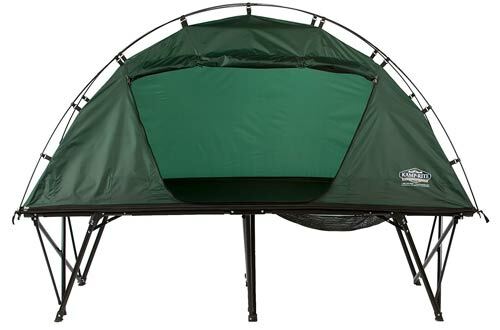 It also has zippered openings at both ends and the elevated platform eradicated the threats of bugs and snakes. The design also allows you to transform it into a lounge chair and convenient to set-up construction lets you install the tent without seeking any help. An ideal solution for an elated outdoor experience more often, the no-see-um mesh doors gives you complete privacy. One of the most durable products is designed to handle the worst of weather conditions. The 4200 D PU coated oxford material lets you have the most of the camping experience even in the worst wet days. Space-saving design allows ease of carrying when not in use and the sturdy aluminium frame allows you to rest 12” above the ground. It also has breathable micro mosquito mesh, so that you can have the most of the camping experience without any interruption from the wild bugs. The folding tent cot also has a waterproof bottom material and can be folded to form a flat cot as well. Do you need anything more? Though it is an extra-large cot for a better sleeping experience, the design helps you fold down this large cot into a very compact 9”*9”*43” structure. 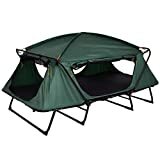 It can be used for various purposes such as a sleeping shelter or a single person tent or even a standard sleeping cot. 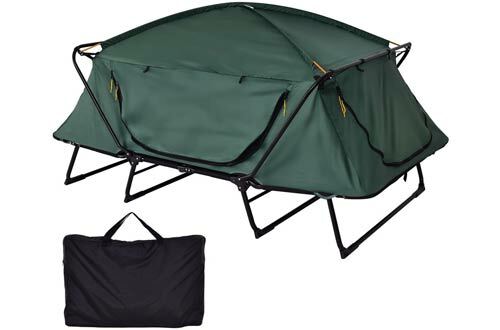 Moreover, it has a storage hammock underneath for storing all your essentials and the durable material can take up weights up to 400lbs. The large sleeping area of 84”*32” is a stand out feature of this product. 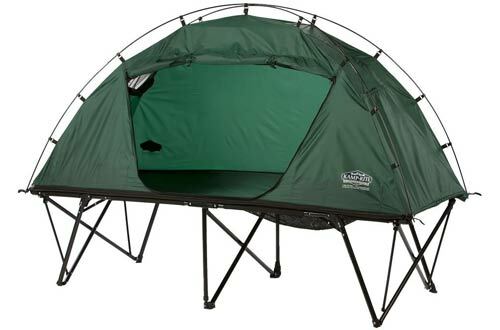 This one person tent cot from Ozark Trail can support a weight of 250 lbs with ease and packs a superior camping experience. It has very easy to set up design that can be set-up in just seconds. The smart design has spaces for storing gears inside the cot and a few storage pockets as well. When folded, it just weighs over 25 lbs and can be transported from one place to another. The sturdy design is durable and the package includes all the stakes and ropes you require for setting up the tent in no time. 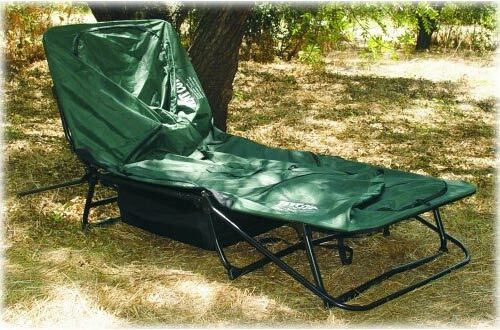 Another two-person cot from the reliable name of Kamp Rite, this compact double tent cot is 10” high and eradicates the problem for you to sleep on the damp or rocky ground eliminating the threats of insects or snakes. The sturdy design not only is highly durable but can be folded down to a very compact size for easy transport and storage. It only weighs a mere 29lbs when folded so carrying it from one place to another is not an issue. The 84”*55” structure has a weight capacity of 550 lbs ideal for two persons. From sleeping shelter to cot frame when the top portion is unzipped, it also has a storage hammock for accommodating every necessary product. The easiest to set-up cot from the house of Ozark is certainly designed to give you a hassle-free camping experience. Beautiful design and appealing, this best tent cot is one of a kind. The oversize steel frame and the cot can be set up in just seconds. 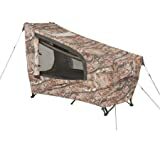 Besides being really easy to set up, the tent cot features no-see-um-mesh doors and a sturdy steel frame that keeps you 16” above the ground. Everything is pre-assembled in the factory and once its set up can easily hold a weight of 300 lbs. Say ‘hi’ to new gen camping. Be it camping in the midst of nature or in your backyard, the excellent tent cots will stand up to your expectations. Just a few installations and these are ready to go.